We continue our Recommended Reads feature, where we highlight books for children and young adults, with the Seeds of America trilogy of historical novels by Laurie Halse Anderson, published by Atheneum Books for Young Readers. Awards: Chains was a National Book Award finalist and winner of the Scott O’Dell Historical Fiction prize. Forge was named a Junior Library Guild Selection, a Kirkus Best Book for Teens, and a YALSA 2011 Best Book for Young Adults. It also appeared on the Horn Book Fanfare List of the best books of 2010. Plot(s): Isabel is introduced in Chains as an orphaned slave girl in New England left to care for her mentally handicapped younger sister Ruth. Although her mistress swore to free Isabel when she died, documentation of this fact is difficult to track down after the old lady’s death and Isabel and Ruth are sold to a family in New York. Here, Isabel meets Curzon, slave of a Patriot master, who persuades Isabel to supply the rebel forces with damning political information about her cruel Tory masters in exchange for her freedom. Alas, the would-be Americans care as little for the fate of a slave girl as do her masters, and despite the information she provides, Isabel finds that she must act for herself if she ever wants to be free. But Curzon, who has fought in the first few battles of the Revolutionary War in his master’s place, is dying of illness and starvation in a British jail, and Isabel decides she can’t leave him behind. She stages an ingenious and daring escape, and the book ends as both set foot on the shore of New Jersey, free at last. Unfortunately, freedom was not that simple for escaped slaves. In Forge, the narrative is taken over by Curzon, who reports that Isabel has flown the coop in search of Ruth and he is on his own. Under the guise of a free man, he joins the Patriot army yet again, in exchange for food and pay. Things are going, if not smoothly, at least somewhat tolerably for Curzon until his captain announces that the troop’s next move is to head for a winter camp, a place called Valley Forge. Curzon endures the blistering cold and aching supply shortages with his fellow soldiers until he runs unexpectedly into his former master and is pressed into servitude again. The only positive outcome of his re-enslavement is his reunion with Isabel, who has also been recaptured and forced to work for the same man. This time, it’s Curzon who, with the help of his friends in the army, arranges a successful escape for the two friends. Ashes, the final installment of the series, promises to continue the story of these two protagonists. Adult Themes: Slavery and war are gruesome topics, and it is to Anderson’s credit that she does not shy away from some of the uglier aspects of life for the people who actually lived during Isabel and Curzon’s fictional existence. While the violence and cruelty are never gratuitous, particularly sensitive readers may want to read these with an understanding adult who can help them grapple with some of the darker chapters in United States history. Our Take: Is there anything better than a good work of historical fiction? Yes, if it’s one of a three-part series and you know you have two more novels to enjoy! Isabel and Curzon are so three-dimensional that even history-averse readers will find themselves fascinated by Anderson’s rendering of their world. 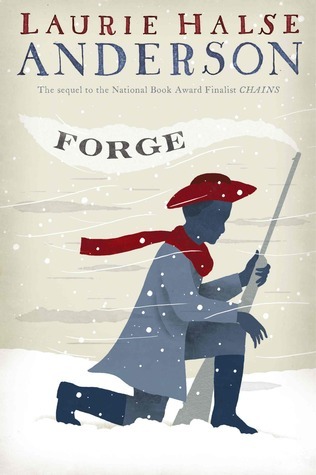 In Forge in particular, the irony of a country fighting for a freedom that it denies to its slaves is fully explored, setting the stage for stimulating critical thought and discussion. Anderson begins each chapter of each book with a real quotation from a concurrent primary source that echoes the chapter’s themes. Additionally, extensive sections found in the back of both books explain which characters were fictional and which were not, the meanings of authentic words from the period which appear in the text, and other interesting information. Seeds of America showcases the very best kind of historical fiction: the kind that makes historical events feel relevant to readers more than 200 years later.